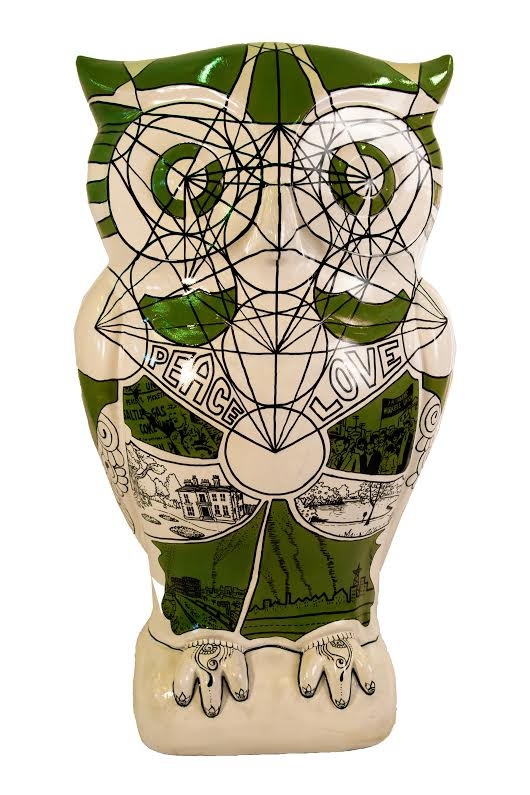 On September the 21st, I was dashing around north Birmingham searching for the fibreglass owls that make up The Big Hoot trail. 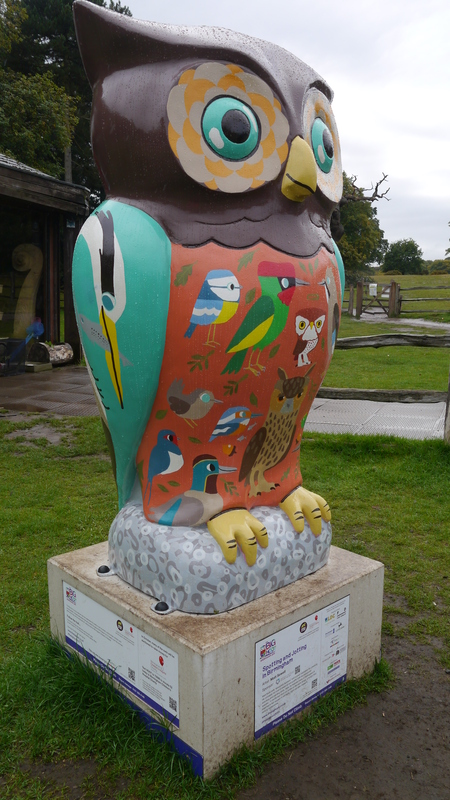 One I found was number 66: Hedwig Owl by Michelle Heron. Michelle Heron is a painter based in London. When she’s not painting owls, Michelle has special interest in depicting seemingly ordinary and mundane scenes that are often overlooked. Many of her paintings stem from the disappearance of socially and historically important buildings and her love of vintage signs and shop fronts. Michelle has designed and painted sculptures for similar public art events in London. 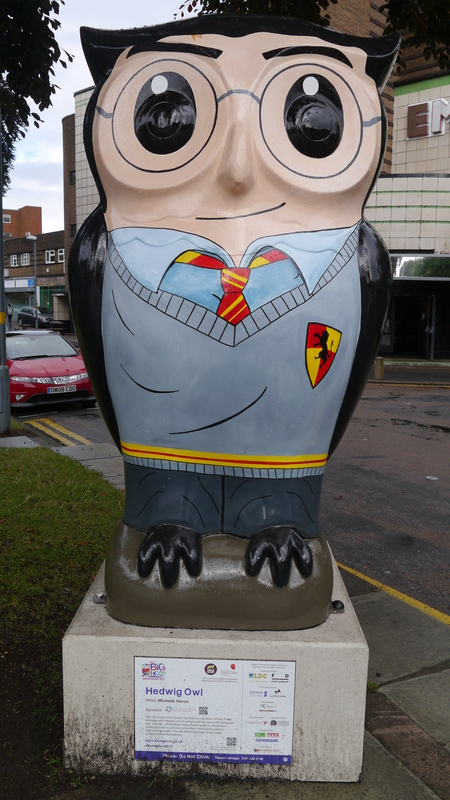 On September the 21st, I was dashing around north Birmingham searching for the fibreglass owls that make up The Big Hoot trail. 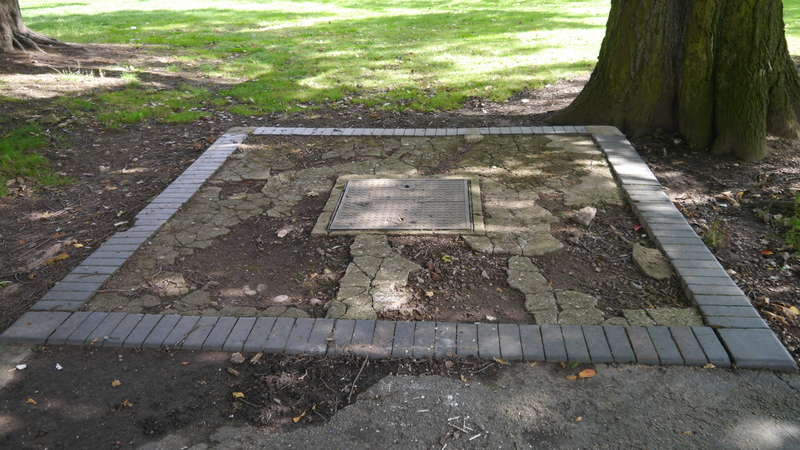 One I found was number 63: Spotting and Jotting in Birmingham by Matt Sewell. Globally acclaimed artist, author and illustrator, Matt Sewell, from Shrewsbury, has been described as the ‘Banksy of the bird world’! Matt has always experimented with different canvases, including T-shirts, posters, interiors and walls, and he now adds owl sculptures to his repertoire! He has illustrated for the Guardian newspaper and Barbour (amongst many others), painted underpasses for the RSPB, and exhibited in London, Manchester, New York, Tokyo and Paris – as well as being an avid ornithologist and regular contributor to the Caught by The River website (he also designed their logo). He was formerly an artist in residence on BBC Two’s hit show, Spring Watch. Matt has illustrated and written a series of bird-themed books, including Our Garden Birds, Our Woodland Birds and his latest book, Owls – our most enchanting bird, which is all about his fabulous, eagle-eyed friends. It sold 7,000 copies in its first week! On September the 21st, I was dashing around north Birmingham searching for the fibreglass owls that make up The Big Hoot trail. 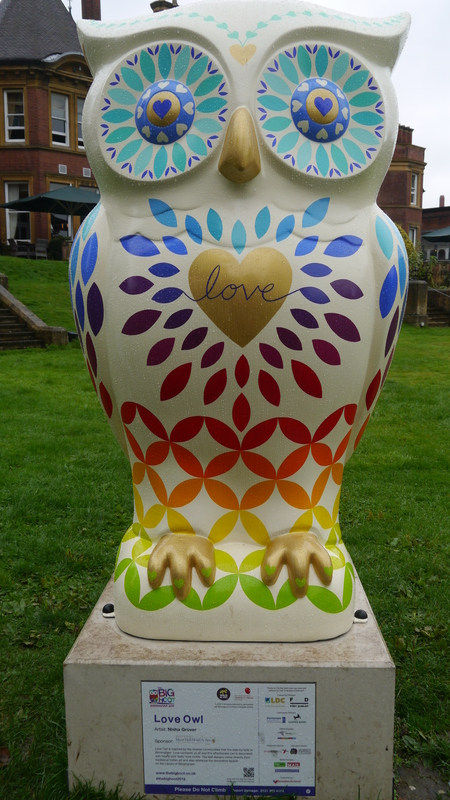 One I found was number 67: Love Owl by Nisha Grover. Nisha Grover is an artist working and living in Birmingham. Since studying Textile Design at Central Saint Martin’s in London, she has worked on private and educational commissions, interior and mural design, exhibitions and schools and community workshops. Generally, her work is inspired by creation and nature and is influenced by the artistic traditions of India and the East. She has created a fusion of western and eastern design by combing paint and using collage and printing techniques on canvas and wood.